We are moving forward with Stop 5: TJFS Kirkwood! Sunday, March 10 Finals Day for All Divisions. In the case of inclement weather the National will take priority over the Regional. We will keep you updated as we get closer to the event if there are any changes. In this epic winter we all need to be flexible moving into this comp. It is our goal to provide the starts the athletes need for their IFSA national ranking. Please stay tuned to the website, Remind, and email updates in case of any changes to the schedule. Registration Reminder: Your registration from Stop 2: TJFS Kirkwood has been transferred to the rescheduled date--you do not need to re-register. For those that requested a refund, your refunds will be processed this week. The cancellation policy is in effect for the new dates. Please see your registration confirmation email or the website for details. Upstairs in Red Cliffs Lodge. Complete the waiver below to complete your athlete registration. For more detailed information about Release of Liability waivers go to Event Registration Information. You need to click the "confirm email address" box on the e-signature confirmation email for this waiver. This step validates the email address. Click on Stop 5: TJFS Kirkwood Rescheduled Athlete Profile. 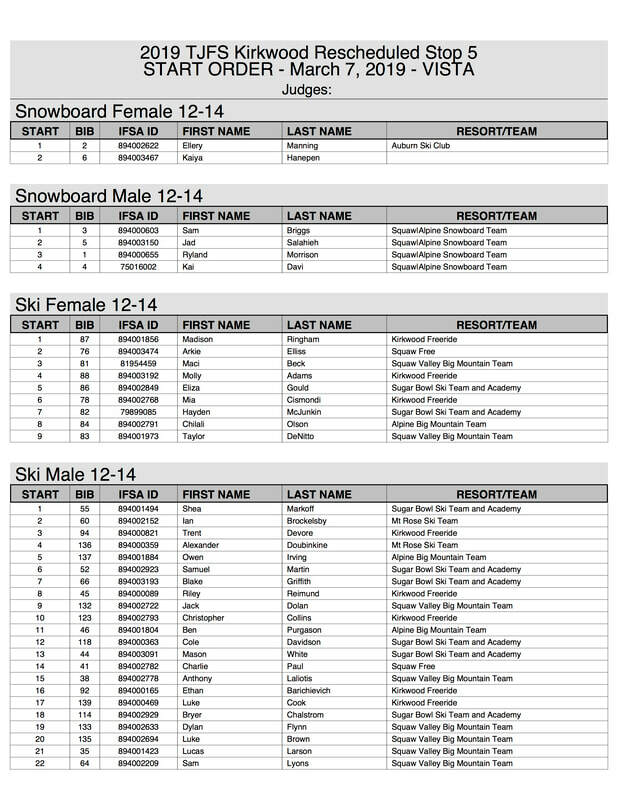 PRINT, COMPLETE, and BRING your completed athlete profile to registration on the first day of competition. The TJFS depends on the generosity of volunteers for the success of every event! Please fill your first and last name into the Stop 5: TJFS Kirkwood Rescheduled (March 7-8) Volunteer Sheet. AFTER you have signed up on the sheet above, email info@tahoefreeride.org so we can give you the details. Put Stop 5: TJFS Kirkwood Volunteer in the subject. Thank you for your support! All times are subject to change due to conditions. Please follow Remind, TJFS on Facebook, and check the white board in the reg room for updates. ​Join Remind: text "@tjfs-2019" to 81010. Registration for Stop 5: TJFS Kirkwood Rescheduled registration is closed.